Hello! Welcome to the day 3 of Taylored Expressions September Sneak Peeks! It's TE's sixth birthday! To celebrate, along with new stamps and dies, we are releasing our very own line of patterned paper and coordinating cardstock, as well as our own Embossing Folders! All products will be released tomorrow @ 7 AM PST. I have more birthday themed cards! The first couple use the new Up, Up, & Away Cutting Plate. 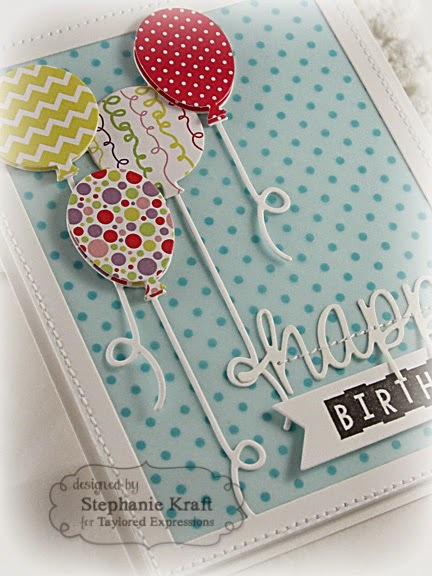 The plate also comes with balloon dies to make piecing the balloons so easy. 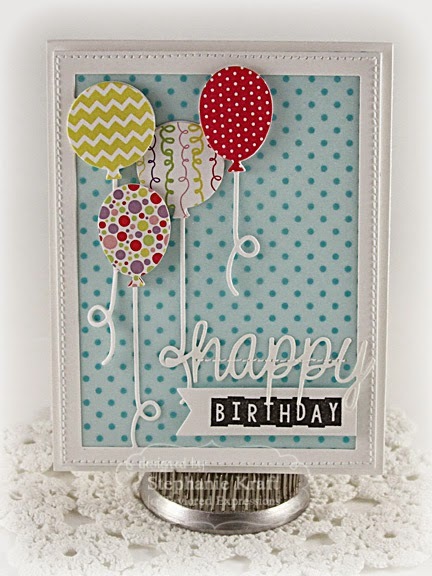 The first version has a blue vellum polka dot background and is pieced with the more girly patterns from the Double the Fun paper pack. 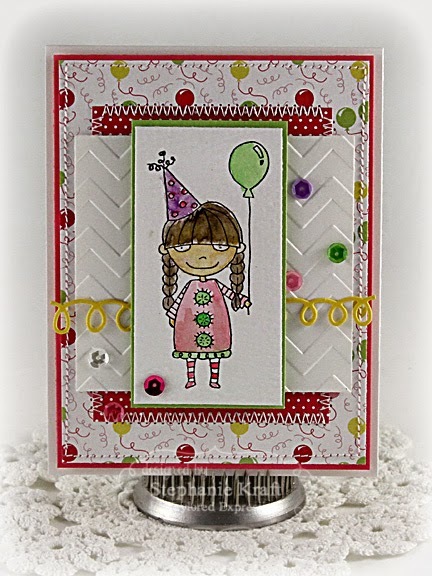 The "happy" die cut is from Think Happy (this month's incentive set - more on that below) and "birthday" is from Little Bits of Birthday. 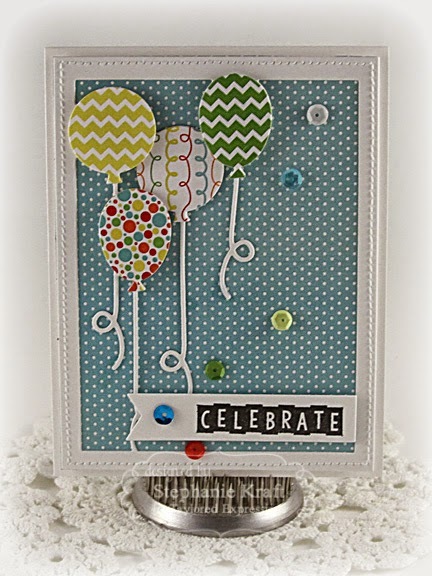 The next card features some primary patterns from Double the Fun and a scattering of Double the Fun sequins. 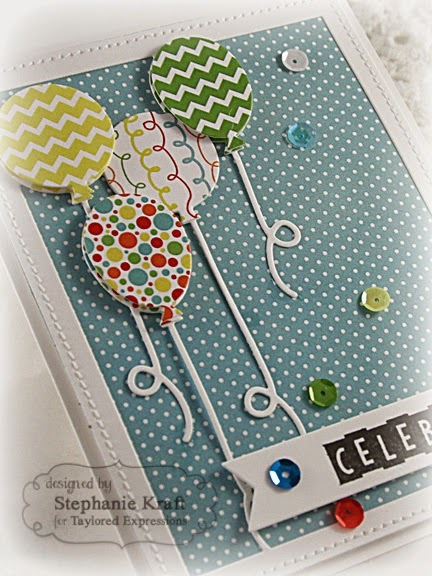 "Celebrate" is also from Little Bits of Birthday. 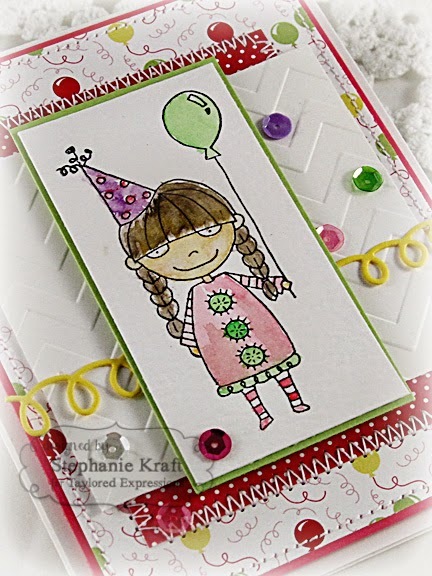 My final card uses one of two Mischief Maker stamps releasing this month. This one is called Mischief Maker - Carried Away. I used watercolors to color her up. Great set of birthday cards Stephanie!! Loooove that first one, especially. All the white accents are so pretty. Thanks for sharing.